I was on a desperate mission to help my chronically ill toddler when I was thrust into the world of real food. Early in 2011 I started her on GAPS, and frantically searched the internet looking for help with ferments, broth, and cleaning out my pantry. GNOWFGLINS was my first major real food discovery (tried the not-so-tough-jerky — still one of our favorites). Later that year I discovered that Dr. Natasha Campbell-McBride would be in Dallas doing an all day GAPS training for the Weston A. Price Foundation annual conference. Being a veteran teacher I am a little nerdy about conferences, and even though I had no idea who Weston A. Price was, I was not about to leave a single rock unturned when it came to healing my daughter. Dr. Natasha saved my daughter’s life. I know it sounds entirely dramatic, but it is also the absolute truth. Ellie was filling her diapers with blood by 10 weeks old. It was extremely scary. She went through months of blood work, tests, scopes and biopsies. By 10 months old she received the diagnosis of Food Protein Induced Enterocolitis Syndrome, or F.P.I.E.S., which I was told meant “allergic to all food”. What I knew to be true was that when she ate any food the result was a reaction that could include projectile vomiting, profuse acidic diarrhea, dehydration, or blood pressure changes resulting in shock-like symptoms. As she got older, she got worse, and her predicted outcome got worse. She was prescribed a highly processed, medical grade, canned formula that she was expected to live on — perhaps into her school age years. The morning of her first birthday she was gifted her first colonoscopy. And with each day she got worse. She began regressing developmentally. EGID, disaccharide deficiency, colitis, unexplainable respiratory symptoms, and petit mal seizures were all added to her chart. At 18 months old, an allergy test revealed that she had a severe allergy to corn, and once again doctors were stumped. There was no formula in existence that did not have one of her top allergens as an ingredient. We were sent home with instructions on what we could try to feed her. And that was the push I needed to make the leap. I started her on GAPS and the rest is history. We weaned her off of the formula and onto broth. Within 24 hours of the last formula bottle she said 6 new words! And within 3 months, she had caught up on all major milestones. It was not easy, but it was incredibly worth it. She has been growing, healing, and thriving ever since. A lot has happened since that trip to Dallas. Ellie spent 16 months on a restricted stage 1 of just broth, meat, and zucchini. After 22 months she is now on stage 3, and we celebrate her progress every day. Each healing journey is individual, and I know that hers is going to take time. But now I know that she will grow up to be just fine. I have known fear. I have been told there is no answer. I have held my 18 month old toddler and feared that she wouldn’t make it until morning, when her only source for nutrients was making her sicker. I have spent countless hours researching, reading medical studies, and trudging from appointment to appointment, just to hang on to hope. There is hope. There can be healing. Ellie is my homegrown proof. And now I am absolutely passionate to reach as many mamas as I can with that hope. The result of that has been the development of GAPS Kids, a support community. We started as just a handful of mamas, and now have a community of entire families working to encourage each other on the path of healing and hope. It’s a safe place to find resources, ask questions, see success stories, and know that you are not alone. Each GAPS journey is different, because God has made us all completely individual. But the need for hope and community is always the same. Have hope! 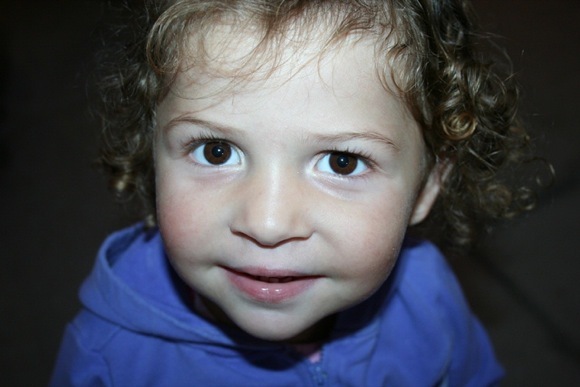 If you're in need of hope and help, please visit Nichole's online support community: GAPSandKids.com. And in the comments below, please share: how is God giving you hope? I am speechless. That story is a miracle. It took me years to find out about real food and WAP, let alone gaps. So glad God has blessed your family in such a huge way. HI Kathryn. Thank you so much! We find it to be a miracle indeed, and are so incredibly grateful to God for her continued healing. Wow. This story!!! Thank you SO much Nichole and Wardee! I am ecstatic for Ellie and in love with GAPS Kids. was thinking the whole time I was reading: God is so good!! Thank you Summer. Agreed! He is entirely good, and faithful. To Him be the glory! Hi Caroline! Love your blog – your story is truly inspirational and refreshing. ok long response back 🙂 Unfortunately there are quite a few kiddos in the GAPS Kids group who have had to start with a limited diet like Ellie. Ellie’s corn allergy was/is very severe. We are well versed on those limitations you experience. At 18 months old her APT (atopic patch testing) left a scar on her back, and being the room where there was popcorn gave her respiratory symptoms. We still have a corn free house, and as you know it is quite the feat. Our experience with Ellie has been that she needs a combination of time to repair, as well as figuring out what hurdles are keeping her from healing. Her detoxification system has had a hard time getting a jump start and held her back quite a bit. Each time she gets stuck we stop and evaluate her environment and her body response. That has meant using some of the additional recommendations Dr. Natasha makes in severe cases, like moving on to raw egg yolk before tolerating veggies. She now is able to tolerate environmental exposure and topical exposure to corn, such as with paints or if someone else touches her, but not straight corn. My personal experience is that I spent so much time figuring out what things were ‘corn derived’ that I forgot it didn’t matter – it was an unnatural chemical that her body needed to detox (like that wax on produce). We have worked with a GAPS doc who acknowledges Ellie’s case being severe enough to need some assistance, and so she is on a couple of medications that help her immune system to detox. We should be able to stop those soon since she is progressing through the GAPS stages. Feel free to send me an email anytime to brainstorm or commiserate corn exposure! Corn elimination is a full time job! 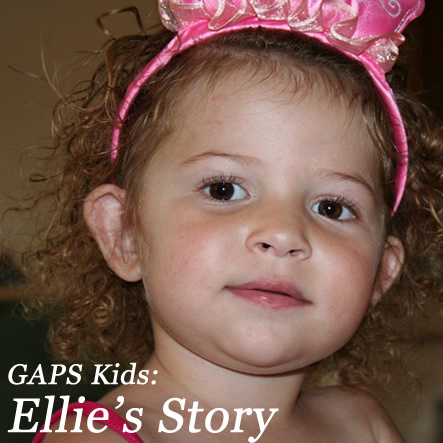 I am curious what your doctos have said about your decision to put Ellie on GAPS, especially in light of her healing. Interesting question! The support we have received has certainly varied along the way. Some have been supportive and others have absolutely thought me crazy. (Unfortunately) Ellie is so severe that the mainstream doctors did not have any answers, and because of this there was little redirecting or suggesting they could do. FPIES is a diagnosis that included being told to feed nothing ‘high in protein’, and to avoid animal based foods. So we were certainly going outside of the box. After doing this for so long we have just decided to work with practitioners who are supportive instead of spending time convincing those who are not. In addition, she had a full set of bloodwork done while still on her lengthy diet of meat, broth, zucchini, and kraut. It all came back fantastic. Her doctors were amazed and many now ask me about the diet. Thanks for the question! Nichole, I am so thankful to God that He helped you find the way to help little Ellie! May He continue to bless you and keep you both, along with your whole family. I pray also that the sheer wonder of what has happened will help convince at least some medical professionals that this isn’t quackery, placebo, or just plain weirdness: it’s our modern diet that’s weird, and whole foods that are good, right, and normal. Thanks Wendy! I think she is cute too 😉 We mommas just want to do the best by our babies, and outside questions can open the door to doubt. That was part of my motivation for wanting a safe group mamas could find refuge during those times. GAPS takes strength, and if you feel Jesus led you there, rest in Him! Wow! What an amazing story. God IS so good and always gives us what we need. And today, I needed to read this story and find Gapsandkids.com. My 16 month old suffers from severe eczema and although I have learned how to manage her skin, she has to avoid a good number of foods. I know there is an internal problem and I want to fix it. It is worth the inconvenience of GAPS for a couple years so that she can enjoy all food in the future! I was struggling with getting started, but now I think I will be off to a great start! Wow this story is amazing! So glad she is doing so much better. Your story also gives me hope as we are in the throws of stage 2 and my sons behavior seems to be getting worse. I assume this is from die-off but cannot be sure so I’m confused where to go from here. But your story gives me inspiration to stick with it and keep trying even though I feel like giving up, especially after this mornings latests 2.5hr tantrum/meltdown. I wish you all the continued success in your GAPS journey to healing.